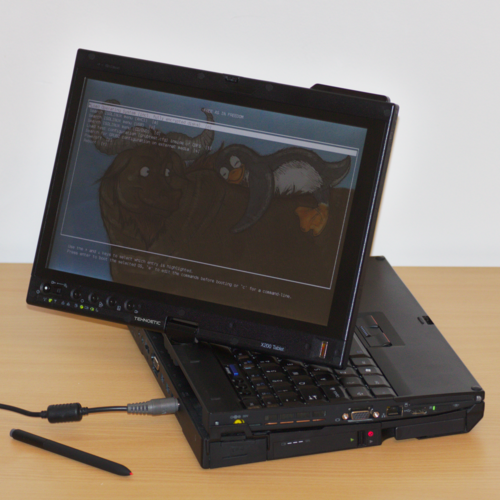 The Technoethical X200 Tablet is a grade A (excellent condition) refurbished 12.1″ fairly modular/customizable Lenovo ThinkPad X200T laptop/tablet convertible preinstalled with Libreboot, the fully free BIOS replacement, and with a fully free GNU/Linux operating system (Trisquel). Enjoy the freedom of having best control of your computing, privacy and security by using the Technoethical X200 Tablet. The Technoethical X200 Tablet has a rotating touchscreen and a built-in stylus. Please note that it doesn't support finger touch, only touch with pen/stylus. Check the specifications section for more details about our X200 Tablet. Libreboot is the fully free BIOS/UEFI replacement endorsed by the FSF. It is based on Coreboot, having the nonfree parts removed and better build system. While most people tend to overlook the importance of having fully free BIOS/UEFI and bootloaders, emphasizing only the need to have a free main operating system, these lower layers of the computer can contain backdoors and security vulnerabilities which have the potential to violate user's freedoms and privacy. However, the control over your computer with a fully free BIOS is incomplete without a fully free GNU operating system, endorsed by the FSF and other free software organizations like Ceata. A fully free system doesn't preinstall, host or recommend nonfree software. Thus users can feel protected from the dangers of proprietary world and also feel part of the community which contributes to the advancement of the free digital society. The society which Richard Stallman has envisioned and has been fighting for for more than 30 years. Technoethical donates part of its income to different free software projecs. We list the donations on the page Technoethical donations. RAM Default 4GB (2x 2GB) DDR3. Upgradeable to 8GB. Upgradable to Atheros AR5BHB116 300Mbps Dual-Band. Bluetooth Yes, v2.1. Upgradeable to Bluetooth 4.0 using miniPCIe to USB Adapter.